Available in Black, Yellow and Translucent Blue! 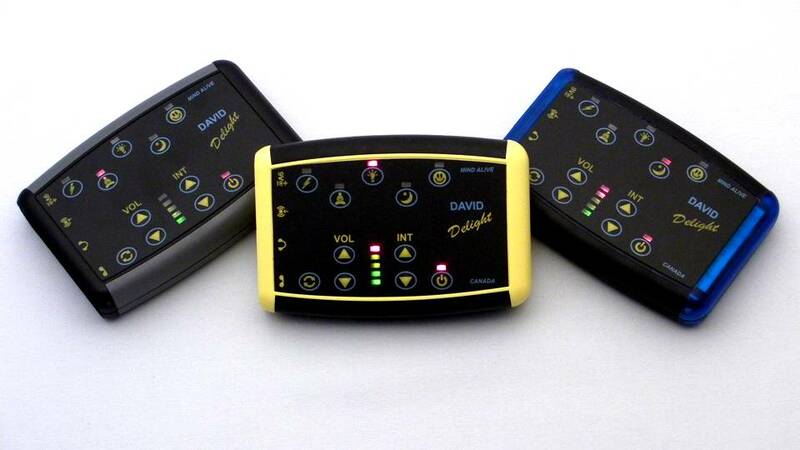 The DAVID Delight Plus offers 25 of our favorite sessions plus 5 Sound Sync sessions! Our sessions have been thoroughly tested and are designed based on most current research findings to ensure you the most effective results. The sessions on the Delight are supported by research studies which include Seasonal Affective Disorder, stress reduction, insomnia, improved mood, mental sharpness and balance (reduced risk of falling) in seniors, and reduced worry plus improvements in concentration and memory in college students. The Delight Plus sessions also include our proprietary randomization process, which helps encourage dissociation and brain frequency tracking to the stimulus. The Delight Plus features larger easy-to-read, easy-to-operate buttons and allows users to select a session very easily. It features five distinct categories of sessions: Energize, Meditate, Brain Brightener, Sleep and Mood Booster, with five selections for each category. It also includes five auto playing Sound Sync Sessions and five locations for you to store sessions you design with the DAVID session editor. The Delight Plus also features night-vue ability, which allows the user to see the session select buttons in the dark at bedtime or at night..